AIM Academy and the AIM Institute for Learning & Research in collaboration with Yale University’s Haskins Laboratories announced in March 2018 that they will become the first educational partner of the Haskins Global L2 (Language & Literacy) Innovation Hub to improve language and literacy outcomes for children at risk of reading difficulties across languages and cultures. This international and interdisciplinary collaborative, brings together researchers, practitioners, educators and education technology specialists to use new approaches to: 1) improve the sensitivity of early language assessment and intervention, 2) deliver on the promise of neuroscience-guided reading instruction and remediation 3) scale the solutions to global challenges using education technology, and 4) train a new generation of educators and clinicians. In December 2017, AIM was awarded a $500,000 RACP (Redevelopment Assistance Capital Program) grant from the state of Pennsylvania to support a build-out of AIM's high school campus space. Construction on this dynamic space began in June 2018 and is expected to be complete by the start of school year in the fall. AIM Research Advisory Board members not only provide our institution with insight on the latest literacy research, but also continue to make a mark on the national and international discussion of literacy and learning differences. In April, the research of Julie A. Washington, Ph.D., Georgia State University, Professor and Program Director in Communication Sciences and Disorders, was featured in an article in The Atlantic. The diagram of Dr. Hollis Scarborough's Reading Rope, which details the many pieces of learning that go into creating a successful reader, can be found on the wall of each of our classrooms. It has been a key part of the AIM curriculum since opening our doors in 2006. In 2017, Dr. Scarborough, senior scientist at Yale's Haskins Laboratories, joined our AIM Research Advisory Board. AIM named a 21st Century Skills Exemplar School. We are one of two schools in Pennsylvania and the only school for children who learn differently to receive this prestigious honor from the Partnership for 21st Century Learning, a national organization that serves as a catalyst to position 21st century readiness at the center of US education by building collaborative partnerships among education, business and community and government leaders. Beginning in Fall 2018, AIM Academy will begin working with Carnegie Mellon University as a pilot site for their new Computer Science Academy to teach coding to high school students. AIM Academy was selected by the Specialized Foundation in 2016 as to participate in its Riding For Focus program, creating bicycle classes and curriculum for Middle School students with ADHD. AIM students are proud to be part of this ongoing research project providing information to researchers at Stanford. The establishment of the program also spurred the creation of AIM's Upper School, competitive mountain biking team. AIM Lower School Curriculum Instructional Leader Julia Salamone joined Research Advisory Board member Dr. Michelle Duda and AIM founders Pat Roberts and Nancy Blair for a presentation at the October 2017 International Dyslexia Association Conference in Atlanta entitled: "Making Connections: The 10-year journey of an Independent School to build bridges between research to practice & practice to sustainable implementation." AIM Assistant Head of School Dr. Grace Ashton traveled to St. Petersburg, Russia in June 2018 to participate in The Dyslexia Foundation's Extraordinary Brain Series conference, "All about language: Science, Theory and Practice" with AIM Research Advisory Board member Dr. Ken Pugh. AIM's Director of Speech and Language Erin DeVault was selected to participate in the 2018 Leadership Development Program at ASHA (the American Speech-Language Hearing Association). AIM Founders Pat Roberts and Nancy Blair traveled to South Africa in June 2018 to attend The Dyslexia Foundation's Extraordinary Brain series conference on dyslexia with AIM Research Advisory Board members Dr. Don Compton and Dr. Julie Washington. AIM Lower School Interactive Humanities teacher and Curriculum Instructional Leader Emily Pritchard shared some of AIM's innovative education at New Profit's ReimagineLearning convening in Boston in October 2017 as part of the group's Live Learning Environment sessions. AIM Middle School Science Teacher Chrissy Mellon was nominated by a parent and selected by the Philadelphia Phillies as a Top 10 Teacher All Star for 2017 because of the dedication and effort she takes to help her students learn. AIM's Occupational Therapy Department has been selected to partner with nationally-ranked Thomas Jefferson University's Occupational Therapy Department to become a Promoting Environments that Measure Outcomes (PrEMO©) site. AIM is fortunate to be 1 of 3 organizations in the area to have this distinction as an innovative site that measures outcomes through innovative occupational therapy service delivery, student education, research, and community partnerships. AIM faculty routinely present at international and national conferences including IDA, ISTE, LDA and NAIS. Our FRC Robotics Team 5407 are world champion competitors once again. After a strong season in which the team was recognized with the Engineering Award at every regional competition, the Wolf Pack team was selected to travel to Detroit for the FIRST World Championship in April 2018. AIM Media and Dramatic Arts students continue to be recognized for their dramatic writing and cinematic skills. AIM students have had original monologues performed by professional actors at Philadelphia monologue festivals through Philly Young Playwrights and had student films honored with awards in the Greenfield Youth Film Festival and the WHYY Youth Media Awards. AIM 6th Grader Sammy K. '24 juggled class and homework with rehearsals and performances for her role as the orphan Duffy in the Walnut Street Theatre's holiday production of the musical Annie in 2017. 5 AIM seniors in the Class of 2018 were the first students to participate in AIM's new college partnership with Drexel University's Close School of Entrepreneurship. Students took a college-level Introduction to Entrepreneurship class at Drexel for college credit. In June 208, three AIM students, Robbie N. '19, Shayna P. '20 and Brandon S. '20 pitched their online services business idea to Jarrod Kahn, President of Accessories and Home for Global Brands Group at his office in New York City. AIM alum Andrew Rosenstein '17 published his first book before his senior year. A Millennial World, which provides insights for companies marketing to millennials as well as shares Rosenstein's experience learning to manage his dyslexia since arriving at AIM. Rosenstein, who has started two businesses since coming to AIM, was featured in a 6ABC Action News story about his book and experience during Dyslexia Awareness Month in October. AIM is a member of the Tri-County Independent School League (TCISL). AIM athletes were named to league All-Star teams in soccer, boys basketball and girls basketball during the 2017-2018 athletics season. AIM's Boy's Basketball team won their division in the TCISL. AIM's Class of 2018 includes our first Division I athlete. Casey Oppenheimer, who has won the Philadelphia-area Junior PGA title two years in a row and led the AIM varsity golf team to victory in the Tri-County League Championships in 2017, has chosen to continue her game playing on the golf team at Quinnipiac University. She is one of three members of the Class of 2018 committed to play collegiate sports in college. AIM launched a varsity Mountain Biking Team in Fall 2017 competing in NICA-sponsored mountain bike races throughout the region. Coach Anne Rock, who also organizes AIM's Riding for Focus Middle School biking class as part of a grant from the Specialized Foundation, has developed a growing team for riders eager to get more kids on bikes. In the 2017-2018 AIM added varsity boys Lacrosse, Swimming and Tennis to its athletic options. AIM's Class of 2018 included 31 students, the school's largest graduating class in its 12-year history. 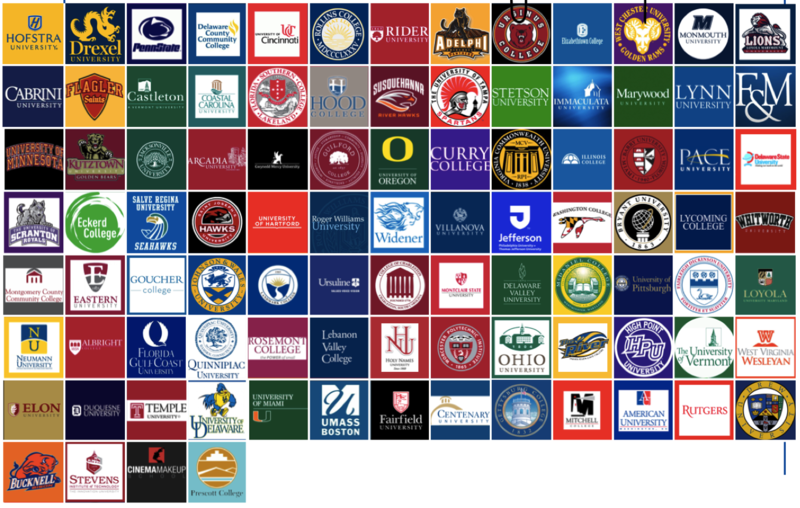 The most recent class was accepted to almost 100 schools including 12 which can be found on the Top 100 List such as Miami, Worcester Polytechnic Institute, Minnesota, Bucknell, Franklin & Marshall, and Villanova. Additionally, 5 of this year’s schools can be found on the prestigious ‘50 Colleges that Change Lives’ list. More than $6.5 million was offered in merit-based scholarships to members of the Class of ‘18. AIM Alumni now total more than 100 for the first time in our school's history.